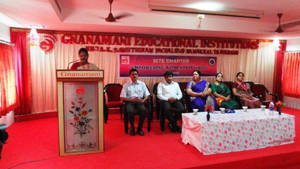 Two of eWIT office bearers, Sarada Ramani (Secretary) and Namagiri Ramesh (Joint Secretary) had been to one of the eWIT member colleges, Gnanamani College of Engineering, near Salem in Tamilnadu. 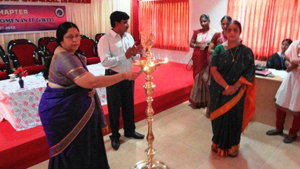 The college has the overall strength of about 4200 students and had organized an exclusive session for female students. 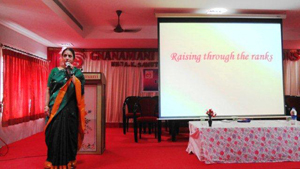 The objective was to provide inspiration with senior female folks in the IT industry speaking on their experience in reaching senior positions. 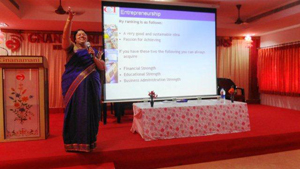 There were two topics - one on entrepenuership by Sarada Ramani and the other on ‘Raising through the Ranks’ by Namagiri Ramesh. Both highlighted the message that it is achievable for a woman to reach greet heights, if it is sincerely attempted and nothing is impossible. This was followed by a debate on Job Vs Career. The session was well received and male students also wanted a similar session for them. One of the participants in her feedback says ‘….very thankful to you for your wonderful presence and informative words for the girls. We are very much eager to listen to you more mam. In future we are expecting more such programs for our development’.